lightcraft harbors the hopes and dreams of four men from Jakarta, Indonesia – the embodiment of their pluckiness and determination. Uniquely narrating the energy and spirit of humanity, their trademark arena-ready anthemic indie-rock sound feature a heightened sense of melodrama that can be heard from their lyrics and felt from each and every note that they produce; all combining to become a united symbol of diversity represented by the four different individuals that make up lightcraft as a solid and resilient entity. Simple humanist themes such as the emotional bond of friendship, life-changing moments and global phenomena such as worldwide immigration are candidly described throughout their music – an achievement unto itself accomplished through inspiring sheer dedication. 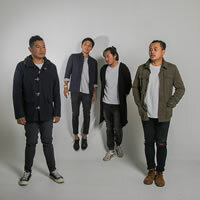 First formed in 2005 when original members Imam, Fari, and Enrico were still university students in Malaysia – drummer Yopi joined the band in 2012 – the band already have a number of releases under their belt. Their very first release was an EP titled The Modern Seasons that was launched in 2006. Debut album Losing Northern Lights was unveiled in 2008, followed by their sophomore full-length effort Colours Of Joy in 2014. In 2015, Love Songs & Lullabies – a cassette featuring songs from their first three releases – was released by Nanaba Records. A split mini CD with New Jersey-based indie-rock band Wyland called Kindred Spirits was launched in September 2016. In November 2016, they unleashed their second EP Another Life. When live onstage, lightcraft are a force to be reckoned with, exuding infectious energy that could amplify the emotions of its audience; mesmerising them into a higher state of consciousness. Combined with their unique sound, it has taken the band across the globe where they have performed at major international festivals and on renowned stages, including in their home country Indonesia, Malaysia, Singapore, Thailand, Japan, South Korea, Taiwan, India, Canada, the USA, Russia, Mongolia, and the UK, encompassing prestigious festivals such as SXSW, Liverpool Sound City,V-Rox, We The Fest, Indie Week Canada, Saarang, Music Matters Live, Zandari Festa, Baybeats Music Festival, B Festival, Playtime Festival, Sakurazaka Asylum and Taichung International Cuisines Festival, among others.